Here in NEMESIS we believe social innovation is a very powerful tool when given to students. Our approach is different from entrepreneurship education, which is mainly focused on (self)employability. Instead, we emphasize the collective ability to identify and tackle social problems, fostering competences such as empathy and social resilience. Actually, we label what we do as ‘social innovation education’, and define it as a “collaborative and collective learning process for the empowerment and socio-political activation of students – to drive social change no matter their professional careers”. Our goal is to empower students so they can become changemakers who know how to bring their ideas into practice. 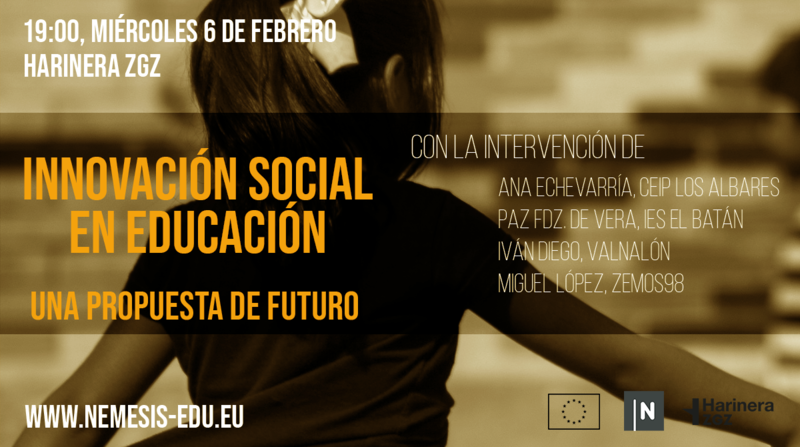 If your are interested in how to start with social innovation in your school or are an entrepreneur or citizen activist willing to share your experince with students from 6 to 18 years old, come see us at Harinera ZGZ (Avd. de San José, 201) next Wednesday, February 6th at 19.00. We’ll be there sharing our experience and willing listen to yours. Speakers will be Iván Diego, from Valnalón,who will introduce you to NEMESIS and the phylosophie behind the project; and teachersAna Echeverría (CEIP Los Albares, La Puebla de Alfindén) and Paz Fernández de Vera (IES EL Batán, Mieres), who will share the experiences from their respective schools. We’ll also have Miguel López, from ZEMOS98, a social cooperative which is collaborating with the schools. You can also check our Facebook event. Please, be aware event will be held in Spanish.